Our weighted exerballs (exercise juggling balls) keep your skills honed and your body in great shape. Great for joggling. 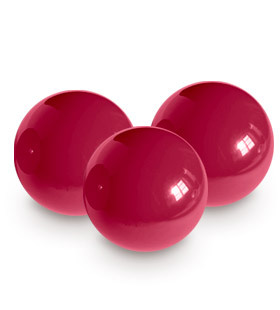 Heavy juggling balls, available in three weights, designed to use the skill of juggling as an upper body exercise. Many beginners have also found the weight of the 1 lb. model to be advantageous for learning. Soft, flexible, vinyl balls are filled with combinations of steel/plastic/lead shot to obtain the different weighted models. For juggling or joggling (juggling while jogging). Daniel Meltzer's 3 ball routine (exerballs at that) in sunny La Croix Valmer, France. July 2009.